In theory a commons is a shared geographic space that is used by a well-defined multi user group. An important defining characteristic of common property is that it is physically, biologically, and culturally bounded. A second characteristic is that the conduct and access of users is based on well-understood rules, for example, expressed as property rights. Property rights are usually one of two types: individual (corporate or private) or collective (aboriginal or state). Property is a modern means whereby use of land and enjoyment of its bounty is secured. Conceptually, common property enables managers to consider the effect of property rights and regimes on the ways in which resources are conceptualized. Living resources as common property are a class of resources for which control of access and exclusion from them is difficult to maintain. Furthermore, each person using the commons will, when optimizing their own production, subtract from the productivity of all others. These two features, access and subtractability, have led to the development and application of a number of strategies, models, frameworks, practices, and processes. Property mirrors social relations; it is defined as functional and instrumental, and it holds an assigned and fluctuating benefit and value. These descriptions of property are cultural, based on a distinctively western capitalist worldview. In relations to management, common property does not convey exclusive entitlements to individuals and it acknowledges that competitive use can lead to depletions. Generally, it can be thought of as both a historic and instrumental arrangement, as well as a modernist response to the privatization of property. What becomes common property and how it is managed are important issues reflecting certain historical and cultural characteristics. Collective rights confer to the holders a claim to a benefit from property or from the right of holding it. Common property describes a certain social relationship that is instrumental in that it enables a community to secure a claim to a benefit stream. As property becomes scarce, it increases in value when there is a constant demand for it. Where there is no demand, value will fade. Common property rights and regimes have responded to the rise of nation states in their search for creating order in the exploitation and development of natural and social resources by challenging the legitimacy and exclusive jurisdiction of the states. To illustrate, a lake is an example of common property. As a source for drinking or for hydroelectric power production, lake water cannot be confined to a simple definition of a single use resource. Lakes are part of a complex web of relationships, the hydrologi-cal cycle, it exists as a gas, solid or liquid. If the cycle is interrupted so as to impair or limit its resilience, the ecological effect will be far greater than from the immediate drawing of water for drinking or damming for hydroelectricity. This example highlights ecosystems thinking, meaning that we conceive of lakes as common property in a larger context. Common property management fits well with ecosystems thinking because it considers the larger context of social relationships. In contrast to the example of lakes as common property, water, which makes up these lakes, is more difficult to conceive of as common property. Human activity is legislated in relations to water for transportation, but water is increasingly being degraded as a sink for pollution. The management of water is a complex equation. Likewise, the physical geography of the land, such as minerals and trees; also air resources, being a medium susceptible to the transport of pollutants, need critical attention of common property managers. Significant issues for atmospheric scientists and communities are declining air quality, ozone depletion, in particular a hole almost directly over the North Pole, and persistent contaminants that are accumulating in Arctic ecosystems. It is important to note that air, water, and land is captured as property to reflect and support dominant social relationships. Common property management, articulated formally as such, dates to the 1960s. However, its practice can be traced to traditional systems of conducting human activities in specific environments that pre-date the rise of formal property management and modern civilization. Each period has lent something toward the current theory and practice. To some extent this approach flourished in response to new knowledge generated through interdisciplinary scholarship in ecology, thinking that has been advanced thanks to scholars such as Rachael Carson, Herman Daly, and Aldo Leopold. Advances in the social sciences, through study of human social organization and land relationships, have benefited common property management. A significant influence came from responses to Garrett Hardin's "tragedy of the commons" thesis. Hardin (1968), by way of metaphor, described an open to all pasture, invariably overgrazed while each pastoralist increased his/her herd size, so optimizing individual production without due regard for other herders and without regard for the pasture. Hardin advocated that the tragedy of overexploitation and population growth could only be overcome by abandoning the commons. He argued for the incorporation of formal property rights, restricting access through state processes or privatization. A significant criticism of the commons tragedy has been that it is overly pessimistic about human behavior, in particular, the development of competition over cooperation; critics have found land use that has not inevitably lead to loss of the commons. It is argued that Hardin's commons was an open access pasture. The commons dilemma remedy of conversion to private property holding under state control, that is, the commons saved by the benevolence of individual landowners, corporations, or under the guiding hand of government regulation, is naive. The argument that the commons are doomed ignores instances where humans do not act as rational self-interested capitalists, where the commons are not depleted and where human behavior enhances them. Many Common Property Rights theorists argue that solutions of privatization, central administrative control, and minimized local-level input, negate common property management premised on participatory approaches, which recognize and support preexisting community-based institutions and processes. Despite the criticism, a goal of management is to formulate solutions to the commons dilemma, to find general constructs for designing success by controlling access. Ultimately, management must strike a balance of property use rights between local communities and outside agents, such as corporations and states, which sustains ecosystems, including humans. Common property is often held in overlapping combinations of open access, private, common, and state property. According to global history, a consistent discouraging pattern of resource exploitation is being demonstrated by researchers. Natural resources are a categorical description for biological units, such as trees or fish and specific species, such as black spruce (Picea mariana) and Arctic char (Salvelinus alpinus). Renewable resources, in crude terms, are material units that have been assigned a value, which can under favorable conditions be replaced. Nonrenewable resources, such as minerals and petroleum, are thought to be finite in supply. As soon as a resource is identified and commodified, is it inevitably overexploited? Small-scale production is an exception to the rule of overexploitation. In the Arctic, historical resource exploitation has been greatly influenced by two distinct perspectives, use by indigenous peoples and use by newcomers. Aboriginal peoples have tended to be small-scale producers, while newcomers have almost always sought larger-scale production in step with technological capabilities. In the past technology hampered or proved too expensive for the extraction of Arctic resources. As resources become scarce and technology improves, Arctic resources are susceptible to the same form of overexploitation experienced historically elsewhere. Traditional societies in the Arctic had very little success in assimilating newcomer societies into their various resource management regimes and institutions in existence prior to contact. By claiming terra nullius, land without title, colonials transformed commons through commercial and industrial resource exploitation via open access. Overall, the thinking by newcomers excluded, for the most part, those who had subsisted and relied on lands and resources for generations. communities who are considered dependent on what are defined as common property, who have successfully managed their affairs as a way of life, that is, management embedded in cultural practices. Cultural factors shape many local institutions and traditional management systems have often been overlooked by outside resource managers because management practices are imbedded in aboriginal languages and cultural practices, such as dances, which are overlooked by those who are well trained in western scientific approaches, but not in other cultures. Common property management tends to focus on either specific areas, for example, the Bering Sea; species, for example, whales; or populations, for example, the Saami people. 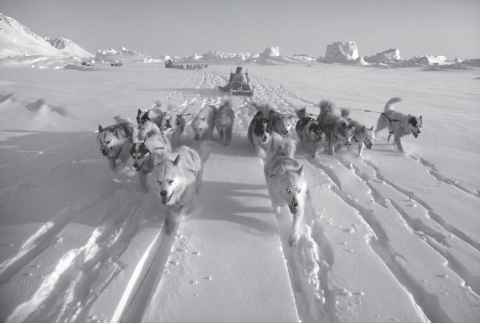 Prior to the 1950s there was no specific or formal resource management in the Arctic. In circumpolar counties such as Greenland and Russia, the modern idea of common property management is viewed as a cushion between traditional ways and competing western systems. Industrial development and various industrial resource extraction projects have been carried out in the North with little consideration for local peoples, a form of colonization that is familiar the world over. Because of the relative newness of its application, there are few examples of common property management in the Arctic that are concrete examples of having either succeeded or failed at resolving the dilemma. However, there are examples that can be shown to demonstrate better management or instances where greater efforts are necessary. The full spectrum of natural capital, whether whales, Arctic foxes, mining, forestry, or natural gas, transcends the exclusive jurisdiction of any single authority and natural influences. Environmental impacts, including atmospheric and climate changes, cumulatively build and alter the health and resiliency of populations and ecosystems. Much of the natural capital of the Arctic has yet to be realized, and in the destruction of biodiversity and cultural traditions we lose a significant understanding of property arrangements that have worked for hundreds of years. Many scholars, in a number of disciplines, are today interested in learning about the sustainability exhibited by lands controlled through the traditional authority of tribal communities. Common property management is part of a suite of approaches, a tool that may be successfully applied in the Arctic. The role of property rights, regimes, and their influences on resources is a key to developing successful environmental management. Access and subtractability makes common property management of relevance to Arctic development and degradation. It is important to acknowledge that commons are in conflict with sui generis rights held by indigenous users who actively resist, guard and restrict access to their traditional lands. In practice, common property management understands that resources are often held in overlapping combinations of open access, private property, communal property, and state property, and that the present state of property rights can vary across time and space. The main goal of management is to formulate an adaptive resolution to the commons dilemma, and to find general constructs for designing successful resource management by eliminating open access conditions. Most property management seeks to strike a balance for resource use rights of local communities, which sustains ecosystems and target populations, together with management responsibilities of outside agencies, such as corporations and states.